Rob and Akiva took time away from putting out dinner table fires to gather for the recap of “The Busboy”, the final episode of Seinfeld’s season two. The episode first aired on June 26th, 1991. Rob thought this was a “sweep under the rug” episode, and Akiva agreed, thinking they shelved it until after sweeps week since it wasn’t a great one. In fact, it was the lowest rated episode of the entire series. Before discussing the plot points, Akiva and Rob went over a few overall thoughts. Rob noticed that the entire episode revolved around everyone else but Jerry, who really just added funny jabs and quips as commentary to the ongoing plot. He also pointed out it was odd that George was determined to help out this busboy without any ulterior motive. Akiva thought that being scared of the busboy might have been that motive, and that George can often be interested in the appearance of being a nice person. He agreed with Rob though that it was a bit off from how George typically is. Akiva shared that there was no current stories pertaining to Seinfeld in the news, but he did a little digging into Jason Alexander and Michael Richards’ IMDB pages to see what they’ve been up to lately. Both have made appearances on a TV Land show Kirstie, a network that Rob likened to an “Old Timers Baseball Game”, where the once greats gather. Other than a few smaller market movies and animated spots for Jason Alexander, the list was short. In the episode, Jerry’s opening credits standup has a few jokes about food, which only loosely ties into the episode. Rob and Akiva thought that his joke about stealing a roll off of the room service cart goes against Jerry’s penchant for being cleanly and germ free, while Akiva wondered if Jerry stole his story from last week’s podcast about the empanadas. Rob pointed out that the bit about “the story of the bill” was either used before, or one we’ve heard many times before. Akiva said that half of Jerry’s standup is about restaurants and planes. The episode starts with Jerry, George and Elaine in a restaurant discussing how pesto is the new trendy thing. George wants to like it, but just can’t get on board. Rob and Akiva asked for listeners to post in the comments what might be the 2014 version of pesto when they couldn’t come up with it on their own. He also felt that Jerry’s comment about the older guy wearing a baseball cap makes it obvious that he’s hiding hair plugs would not relate to 2014, since many older people wear caps regularly nowadays. Elaine starts talking about a guy from Seattle who is coming to stay with her for a week. George calls Seattle the “pesto” of cities. Rob and Akiva felt that today, Seattle is fully established, and is “crushing” pesto. The gang notices a menu on fire at a table next to them, and George quickly goes over and puts it out. Elaine makes a sarcastic comment to the manager that they’ll never eat there again, which prompts him to go over and fire the busboy. Rob shared a story about a similar experience his family had at a restaurant where the waiter was fired in the middle of their dinner for drinking on the job, leaving his dad to give a tip to him, plus another the waiter who finished the service. George becomes worried that he’s at fault for getting the busboy fired, and Jerry furthers this fear by talking about how this could lead him to doing a bunch of horrible things. Back at Jerry’s apartment, George is trying to figure out if he can get this busboy a new job. He’s worried that a new restaurant might check his references, and Jerry has a strange line about how the busboy could be one of those guys wondering the city pricking people with pins. Elaine comes in and tells them that with a bit of charm, she was able to get the busboy’s address. George needs to go to the busboy’s apartment, and since Elaine has to use Jerry’s car to pick up her guy at the airport, Jerry tells him to take Kramer. Akiva pointed out that since this episode was filmed early in the season, the Kramer character is still weird and underdeveloped. Rob thought Kramer’s Harley Davidson shirt was out of place. Kramer and George go to the busboy’s apartment. Rob felt that George was particularly out of character in how he talked with the busboy, sounding meek. While there, Antonio the busboy notices they left the door open, and his cat is missing, which he blames on Kramer and George. Akiva and Rob discussed how there was nothing humorous about the busboy character. Akiva mentioned how many of the early episodes went to a dark place like this. Still at the busboy’s apartment a few hours later, George and Kramer are trying to reassure Antonio that the cat will come back. Kramer accidentally breaks a lamp while there, further agitating the busboy. The next scene has Jerry and Kramer at the apartment with Jerry talking to George on the phone. He is instigating an argument between the two. Rob and Akiva enjoyed how Jerry fueled each of their fires by exaggerating what each of them are saying to each other. Elaine comes in frazzled about how the guy staying with her is driving her crazy. She is trying to avoid dealing with him, deciding how to get him to the airport in the quickest way possible the next morning, even paying a cab driver $5 for advice on the quickest route. She bought a new alarm clock that will “slap you in the face” if you oversleep by ten minutes. Rob and Akiva noted that much of the plotline in the episode is rushed and unexplained. Akiva thought that they were trying to jam too much in, and it seemed like they wrote it in a day. There is a clip of Jerry’s standup mid episode wear he talks about missing a plane, that Rob felt was a bit abstract, but pretty funny. The next scene is at Elaine’s apartment, where she and her guest have overslept. She starts rushing to get them both ready, so she can get him out of her life, even going as far as putting his pants on for him. Rob watched a behind the scenes clip of Julia Louis-Dreyfus talking about how she wasn’t happy about this scene, and how she wished they could have reshot it. Rob and Akiva thought this scene was out of place for Seinfeld. Next, George and Jerry are having a conversation about the best public restrooms in New York. George claims to know where the best restrooms are anywhere in the city. Elaine comes in during this conversation and describes to them how she nearly concurred the New York City traffic to get the guy to the airport, but a pileup on the highway ruined her chance. When the busboy shows up at Jerry’s apartment, they all start to panic, wondering what he’s doing there. When Antonio comes in, he tells George that the restaurant he was fired from had an explosion, killing five people, including the busboy that replaced him. He’s grateful for George saving his life, and to top it all off, his cat returned home too. 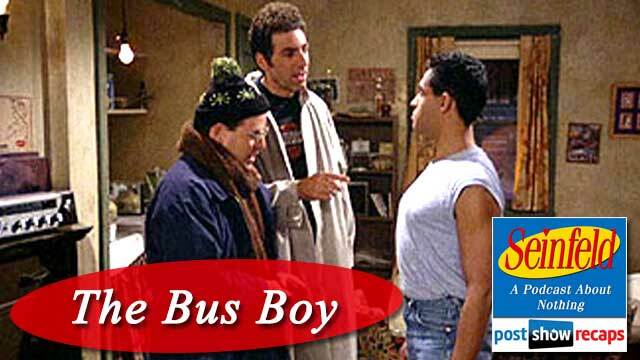 As the busboy leaves, he bumps into Elaine’s guest in the hallway, and the two get into an altercation, ending with Antonio somehow hurting Elaine’s friend, who ends up in the hospital. Akiva and Rob said that while this sequence did tie the different storylines together, they felt it was a weird and dark way to end it. Jerry’s final standup talks about how boxing matches don’t have a lot of build up. Rob said maybe Jerry is more of a wrestling fan than boxing. The guys discussed what would be different in 2014 vs. 1991. Rob thought maybe the cat would have a GPS chip, and that Elaine could have realized through texting that she wasn’t compatible with her guest. Also, there would be many electronic methods to rerouting Elaine’s trip to drop the guy at the airport. Their lone email was from Johnny. He wanted to know if they have seen someone get fired in a restaurant in person. Rob previously shared his story, but Akiva had never witnessed anyone fired in person. He also wondered how far Akiva and Rob live from an airport. Both live relatively close to airports, and have their own tricks to getting through traffic and through security (especially with kids) in time to make a flight. With the end of season two, they discuss their favorite and least favorite episodes. Akiva thought “The Chinese Restaurant” was best, with “The Pony Remark” second. His worst was “The Apartment”. Rob agreed with the top two, but thought that “The Busboy” was the worst. They are both quite excited to start into season three. Akiva said that while it’s not the best of the seasons, it’s leaps and bounds better than season one or two. 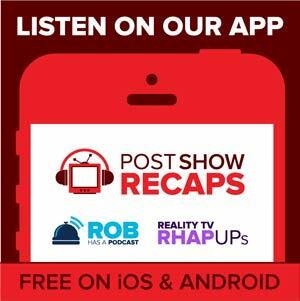 Join Akiva and Rob next time as they will recap “The Note”, which was the season three premiere. Rob encouraged the listeners to share any thoughts and theories they might have by emailing [email protected] , or by posting in the comments section. The best way to get the word out about the podcast is leaving ratings and feedback on ITunes at postshowrecaps.com/seinfelditunes. You can follow them both on twitter @robcesternino and @keev26.